The Ansoff Growth Matrix was first introduced in the Harvard Business Review in 1957 in an article called ‘Strategies for Diversification’. The matrix (also known as the Product Market Matrix) is used to show the opportunities for growth available to an organization. The matrix helps strategists think about not just strategic direction, but also enables them to take account of risk and reward in their considerations. From the diagram you can see that four strategies for growth are identified. Market Penetration – where the company tries to grow using its existing products and market segments – essentially this is a play to increase market share. Market Development – where the company tries to grow by taking its existing products to new market segments. Product Development – where the company tries to grow by taking new products to its existing market segments. Diversification – where the company tries to grow by taking new products to new market segments. The more ‘newness’ is introduced by the new strategy the greater the risk that the strategy will fail. 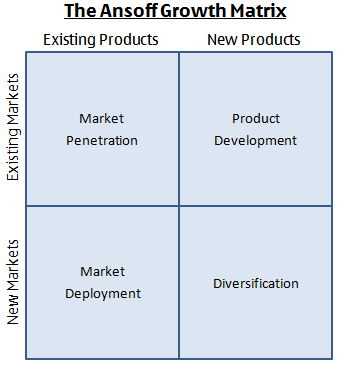 Hence, market penetration is the least risky strategy, with diversification being the most risky. Market development and product development sit in the middle risk wise, being equally risky conceptually. When choosing a growth path, potential risk must be balanced against potentially higher rewards the ‘riskier’ strategy may bring. 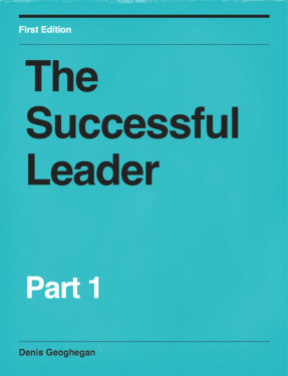 Let’s examine each of the four strategies for growth in turn. This strategy aims to increase market share of a growing market to ensure dominance in that market, but it could also mean to shake up a mature market to capture more market share. There are a number of different ways in which organizations can seek to improve penetration, including enticing customers away from competitors, or encouraging existing customers to become more frequent users of their products. This strategy can be especially successful if increased volumes mean disproportionate economies of scale to your organization. If you decide to implement this strategy you will need to realign your Marketing Mix. This strategy aims to secure growth by selling existing products to new markets. It refers to markets in the broadest sense and could mean new customer segments or new overseas markets, for example. If you opt for this strategy, then you will again need to revisit the marketing mix. You’ll need new promotions to get the new customers, new distribution channels, even new price points to attract your new target customers. Market development can sometimes be the obvious choice, for example, when there are large and untapped markets beckoning, or new channels have opened up to the new markets. Here, the firm aims to secure growth by creating new products for it’s existing markets. New products come in many different forms: improved speed, improved quality, or something to complement an existing product. This can be the obvious choice if you have spare research and development capacity, or if you are noncompetitive because your competitors have obviously better products. Related Diversification: where markets or products share some similarity with existing products, for example, perhaps similar firms within the same industry have already diversified in this way. Unrelated Diversification: when completely new products are introduced to completely new markets. The Ansoff Growth Matrix provides a framework for making strategic decisions about how to grow an organization. In addition to doing this it incorporates the concept of risk into the framework to help strategists make better decisions. If your working as a program manager then you should be aware of the Ansoff Matrix to understand the link between organizational strategy and what you’re working on.